It wasn’t long ago that the Chevrolet Camaro took the world by storm when it set a new track record at the Nurburgring track in Germany. The version of the Camaro to do this was the ZL1 1LE which is the most track-capable Camaro to ever be built. This car was so fast that it made those from the European exotic car companies turn their heads in amazement at what’s been created in the Camaro. While that version of the Camaro was quick and it made the run on the 12.9-mile course in record time, there’s a faster one offered now. For the 2019 model year, Chevrolet decided to make the most aggressive version of the Camaro easier for everyone to buy and drive. This is being done by adding a ten-speed automatic transmission to the mix to give this car more gears and the quick sifts needed. When tested at the 2.9-mile Milford Road Course, this version of the car was more than one-half a second faster than the model with the manual transmission. This means the automatic might be able to shave several seconds off the time at Nurburgring where the length of the course allows you to take advantage of all ten gears. The new ten-speed automatic transmission doesn’t take away from the track experience that you can enjoy when you choose the Chevrolet Camaro ZL1 1LE. This transmission is optimized for speed and track performance to make sure you’re always in the perfect gear when you push this car around a track. This new transmission is equipped with paddle shifters to make sure you can shift and control the gear when you want to, but the tuning of the transmission may make it so that you leave the paddles along and never use them. 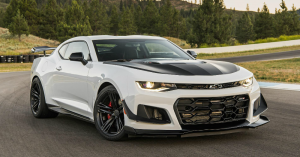 Not only is the 2019 Chevrolet Camaro ZL1 1LE more accessible than in the past with its automatic transmission, but there are also several other benefits to this incredible track car. If you’ve been looking for this car to be the one you can take to the track and have a lot of fun, it’s time to take it for a test drive at your nearby Chevrolet dealership today.